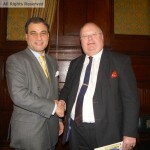 Lord Bilimoria of Chelsea, CBL, DL and Gareth Thomas MP are pleased to announce the establishment of the Zoroastrian All Party Parliamentary Group. 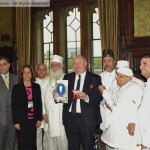 The event, hosted in the Members’ Dining Room of the House of Commons on Monday 14th October with the assistance of the Zoroastrian Trust Funds of Europe (ZTFE), was attended by over a hundred MPs, Peers and members of the international Zoroastrian community, including the Rt Hon Eric Pickles MP, the Secretary of State for Communities and Local Government, and Dr Virander Paul, the Acting High Commissioner of India to the United Kingdom. 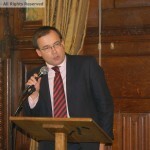 Following the election of the APPG’s officers, the group and guests were addressed by a number of speakers. 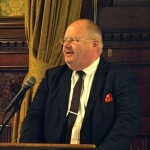 The Secretary of State welcomed the establishment of the APPG, stating that it was “long overdue” in having the Zoroastrian community represented in the Houses of Parliament, Mr Pickles was then presented with a 150th Anniversary medallion by Malcolm Deboo, on behalf of the Zoroastrian Trust Funds of Europe. The new APPG will provide an important link between the Zoroastrians and Parliament, allowing this historic community to be formally represented for the first time. 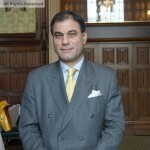 Lord Bilimoria is the first Zoroastrian Parsi to sit in the House of Lords, having been appointed as an independent Crossbench Peer in 2006. 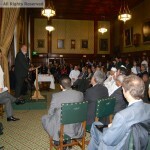 The launch of the APPG is the latest in a number of recent events concerning Zoroastrianism in the United Kingdom. The launch of The Everlasting Flame: Zoroastrianism in History and Imagination at the School of Oriental and African Studies on the 11th October marks the opening of the largest exhibition of its type ever held in Europe. Subject to formal registration by the Office of the Parliamentary Commissioner for Standards, the new APPG will begin a regular program of events aimed at raising awareness of the Zoroastrian community. Further details, including the launch of the APPG’s official logo and website, will be released in the near future. An All Party Parliamentary Group (APPG) is a backbench cross-party group of MPs and Peers who share an interest in a particular issue. Zoroastrianism, which has its origins in Iran circa 1500 BC, is the oldest remaining monotheistic religion in the world. It is also one of the world’s smallest religious groups, with fewer than 200,000 practitioners spread across a dozen countries. With only 6,000 members, the Zoroastrian community is the United Kingdom’s smallest recognised faith group. 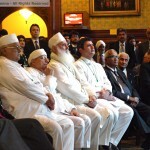 Members of the international Zoroastrian community include the Tata family, founders and managers of the Tata Group, which owns UK operations including Jaguar-Land Rover, Tata Steel, and Tetley Tea; Maestro Zubin Mehta, one of the world’s most famous classical conductors; and the late Freddie Mercury (born Farrokh Bulsara), the lead vocalist and lyricist of the rock band Queen. Additionally, the first three Indian Members of Parliament, Dadabhai Naoroji, Sir Mancherjee Bhownagree and Shapurji Saklatvala, were Zoroastrians. 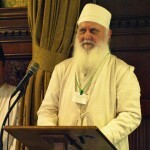 The Zoroastrian Trust Funds of Europe (ZTFE) is the main body representing Zoroastrians in the UK. Founded in September 1861, it is the oldest Asian faith-based organisation in Britain. Photography was provided by Rajdeep Sandhu and Duncan McKenna.